What a pleasure to witness this dualistic play of the non-dualistic One ! What a multiplicity of beauty, panoramic variety and continuity of Love ! Thus revelling in that blissful vision, he continues to pour out his own love (bhakti) to that Transcendental Power from the bottom of his heart. This tribute to the jnAni has been given by the great Teacher Suka himself. 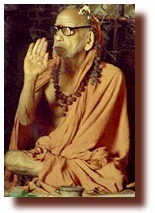 On the one hand the devotee who has yet to get the Enlightenment enjoys the devotional state for the very reason of getting the Enlightenment; on the other hand, the one who is already enlightened and is a jIvan-mukta shows his bhakti for the sake of enjoyment of that bhakti and not for any other reward or purpose.